FCR Prima T2 has been designed for those private practitioners with low volume imaging environments. 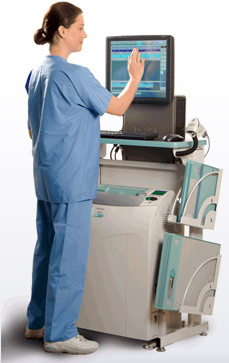 Small, light, fast, it has everything a smart private practice wants in digital x-ray. At just 86 pounds and with a footprint of only 3.2 square feet, it’s one of the smallest table top CR systems available. The FCR Prima T2 stands out for its stunning combination of price, speed and remarkable image quality. Its throughput ranges from a rapid 47 to an outstanding 73 images per hour depending on cassette size. Its 100-micron images provide impressive resolution while Fujifilm’s processing technology ensures your first image is ideal. Only Fujifilm offers Image Intelligence - the Culmination of Over Seventy Years of Image Processing Experience. FUJIFILM Medical Systems is pleased to introduce a revolutionary design for digital x-ray, bringing Fuji's renowned image quality, ease-of-use and high throughput to the smallest full-featured CR systems in the world. 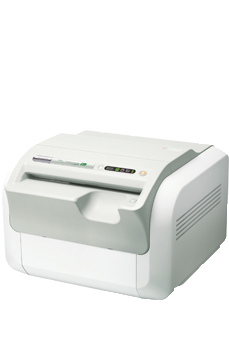 The FCR XL-2 can process up to 94 images per hour, handling even the busiest periods in your office, yet fits right into small exam rooms or offices where space is limited. The FCR XL-2 is capable of producing high resolution (50 micron) scans for 18x24cm and 24x30cm sizes, making it ideal for orthopedic and extremity applications where seeing fine detail is critical. The Flash IIP Console is the heart of every FCR system. It's designed to maximize productivity in the busiest environments. The FCR XL-2 and FCR Prima T both include Fujifilm's Flash IIP Console, an innovative workstation that features powerful productivity-enhancing tools so your staff members can operate more efficiently. Flex UI, the customizable user interface. Our exclusive Flex UI software allows you to customize the Flash IIP user interface according to your group's preferences. This eliminates mouse clicks, making processing exams faster and more efficient. FCRView lets you manage studies like never before. FCRView lets you manage studies like never before. It combines the power to acquire images with an innovative image viewer and a comprehensive archive system so you can initiate and preview exposures, process and print studies and back up patient data all from one workstation. The size, flexibility and speed of Fujifilm CR (FCR) makes it ideally suited for mobile applications. The size, flexibility and speed of Fujifilm CR (FCR) makes it ideally suited for mobile applications. Already popular throughout the world, digital x-ray is gaining promotional products momentum in the U.S. as a practical and time-saving solution for mobile applications. Digital X-Ray with Exceptional Image Quality for Private Practitioners in an Efficient, Compact Package. The inventor of CR technology, FUJIFILM Medical Systems has more experience in optimizing images for display than any other digital x-ray manufacturer in the industry. 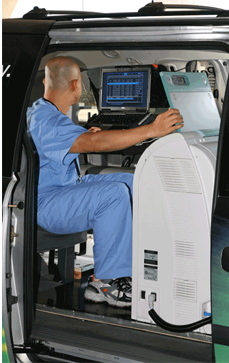 The FCR systems provide chest, abdomen, spine, head and other plain x-ray imaging as well as spinal canal, bronchial tube, urinary organ and other contract medium x-ray imaging. With throughput speeds of up to 72 images per hour, the FCR XC-2 is the smart choice for practices with lower caseloads that simply won't compromise on image quality. It's also perfect for off-site locations that need to transmit images back to another practice.